Never has there been a better time to grow your own food. We know why we should: economics, health, safety…For these reasons South Sound gardeners have been growing food long before it was trendy. Thanks to groups like Master Gardeners, Community Supported Agriculture (CSA’s) and Seattle Tilth. South Sound Gardeners have been taught NOT to grow the same varieties of produce that the local grocery store sells. Why grow the exact same thing you can easily buy? Remember the apple choices we had at the local supermarket a few years ago? There were two… Red Delicious and Yellow Delicious. Now, you need a guidebook to work your way through the maze of new varieties. We discovered that apples taste VERY different from one another. Cross your fingers that this happens to the world’s most popular fall planted bulb…garlic. There are two main types of garlic that comprise a whopping total of 600 varieties! Luckily, they are not all easy to find so you can limit your choices. Out of the 600 varieties, only 2 are usually available in supermarkets. Like apples, all garlic does NOT taste alike. Oh…the possibilities! 600! This is where my eyes glaze over but here goes. The two types of garlic that contain the 600 varieties are hardneck and softneck. Softneck garlic is easy to grow and can be planted with machines. It also keeps well…guess what they sell at the supermarket? A softneck garlic, of course, because it’s easy and keeps well, i.e., not necessarily grown for taste. We’re just used to it. 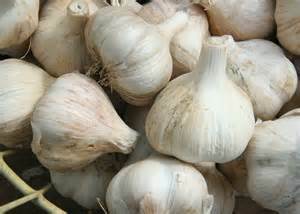 Most commercial garlic is the softneck ‘Silverskin’ variety, the pretty white ones in the bins, bags and braids. Sadly, most grocery store garlic is imported from China (garlic politics). Imported garlic is really, really cheap and the large US growers are having a hard time competing. Grow something besides Silverskin. It’s patriotic. When Timber Press calls it a “complete” book of garlic, they’re not kidding. “The Complete Book of Garlic-A Guide for Gardeners, Growers and Serious Cooks” might be more than you ever wanted to know about garlic but I guarantee you won’t be bored. This isn’t just a book with pretty garlicky pictures. It is a well-researched book with garlicky pictures. Meredith throws in plenty of science and history for nerdy gardener/cooks. It’s a timely tome since now is the time to plant garlic here in the South Sound. Nothing could be easier. They all like the same thing: sun, good drainage and decent soil. Plant the cloves 6” apart and occasionally weed and water. That’s it. You don’t harvest until spring so it’s pretty much “plant it and forget it”. The variety, “Music”, is the local favorite. It is a hard neck variety. It bolts and makes flower “scapes”. That’s a good thing! Garlic scapes (the curled flower stalk) are currently prized by adventurous chefs. Meredith explains when and how to harvest the crazy gourmet scapes and lists the types, subgroups and varieties of garlic that produce them. All those years of “deflowering” garlic scapes and we should have been sautéing instead of composting. This entry was posted in Book Reviews, Garden News, South Sound Magazine Gardening Articles by Vickie Haushild. Bookmark the permalink.